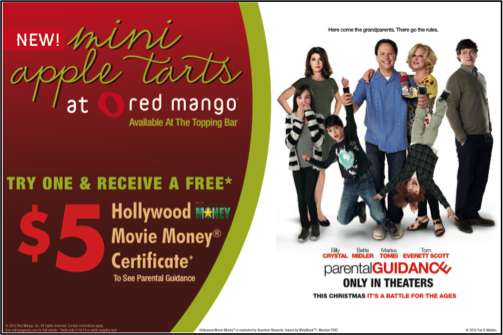 To promote their new mini apple tarts, Red Mango partnered with 20th Century Fox’s family film, Parental Guidance. With the purchase of a mini apple tart, customers were given a Hollywood Movie Money certificate to see Parental Guidance in theaters. Supported with in-store signage and a digital and social media campaign.